This book is a culmination of Dr. Molot’s 30 years of experience assessing, treating, and advocating for more than 12,000 patients with environmentally linked illnesses. He explains how the environment contributes to the development and progression of chronic fatigue syndrome, fibromyalgia and other pain disorders, and chemical sensitivity. He also shows how these disorders are just the tip of a giant iceberg, linking environmental conditions to the increasing numbers of cases of common chronic illnesses in adults and even in children. Read about how you can begin to protect yourself and your family by incorporating Dr. Molot’s nine point plan into your daily life. 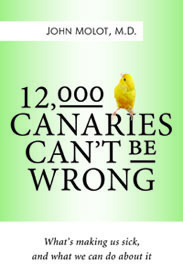 Download an excerpt from Dr. Molot’s new book, 12,000 Canaries Can’t Be Wrong. Requires Adobe Reader or other PDF reading software. The environment is changing health patterns; the incidence and prevalence of many familiar, chronic illnesses are escalating. Emerging conditions such as chronic fatigue syndrome, fibromyalgia, sick building syndrome and multiple chemical sensitivity, as well as the common chronic illnesses in both children and adults are environmentally linked and increasing. 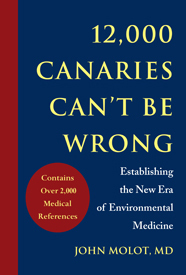 This version of 12,000 Canaries Can’t be Wrong cites more than 2,000 articles from the medical literature published in peer reviewed journals of many health and biology disciplines. All the studies can be found in the database of the US National Library of Medicine.